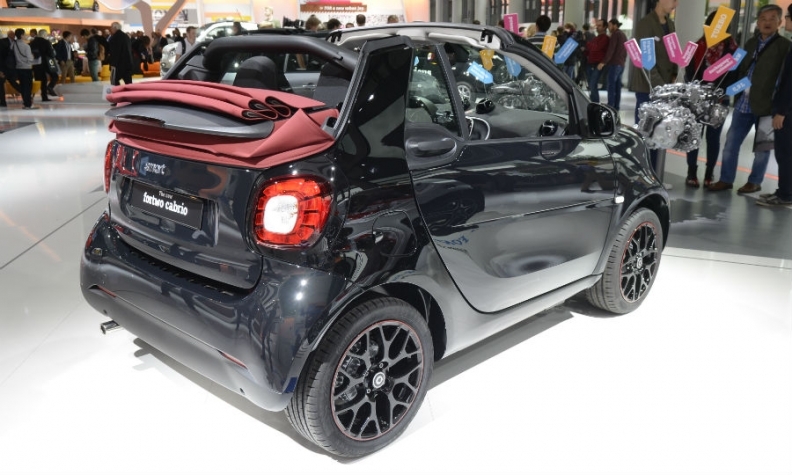 Smart unveiled its latest ForTwo Cabrio at the Frankfurt show. FRANKFURT (Reuters) -- Renault will supply motors for electric versions of Daimler's Smart city cars under their deepening five-year-old alliance, the carmakers said today. The motors will be the same as those used in the Renault Zoe EV. The units are manufactured at the French automaker's plant in Cleon, France. They will equip battery-powered versions of the Smart ForTwo minicar made at Daimler's Hambach facility in France as well as its larger ForFour model, assembled by the French carmaker in Slovenia alongside the Renault Twingo subcompact. All three cars share a Daimler-developed platform. The Renault-powered electric Smart models will go on sale in 2016, the companies said in a statement at the Frankfurt auto show. Batteries for the Smart EVs electric drive will be produced by the Daimler's subsidiary, Deutsche ACCUmotive, in Kamenz, Germany. The alliance between Daimler and Renault-Nissan, launched in April 2010, now covers 13 projects including engines, compact cars and a pickup for Mercedes-Benz.